This is truly funny…And true. Republican controlled states which have implemented the tax cut, destroy public services mantra are in free fall economically. The two most prominent examples of which are Kansas and Louisiana. Even in those states which have good economies such as North Carolina, Republicans rip the wheels off, passing one stupid law after another like the anti-LGBT laws which still may cost North Carolina billions more. In actuality, the most segregated school systems in America are in the Northern Big Cities. Hyper-segregation at the neighborhood level leads to segregated schools. This enforces, and supports different outcomes for black and white children. While black kids certainly don’t need white kids around to learn…It seems far too many school administrators and teachers need white kids around to teach. New York City’s public schools are among the most segregated in the country – a fact that flies in the face of the city’s history as a bastion of progressivism. For this podcast, I spoke with former ProPublica reporter Nikole Hannah-Jones, now a New York Times Magazine staff writer, about her decision to delve deeply and personally into that paradox. Hannah-Jones wrote about the public school her daughter attends in New York City, PS 307. The school is populated by poor children of color from nearby housing projects. It also became the site of community tension when predominantly white and well-off parents living nearby were pushed into its school zone to ease crowding at another school. Hannah-Jones has spent much of the past four years chronicling how official actions and policies perpetuate racial and economic segregation in our nation’s housing and schools. For this story, she focused on the painful choices she and other parents have to make in the absence of official efforts to right past wrongs. Hannah-Jones: I just felt that there was a story that wasn’t being told. That a lot of the history and, understandably, because newspaper reporters, as in TV reporters, have very short time to turn around something, they don’t have a lot of space. They have to move on to other things. I felt like we were writing about all of these tensions and this difficulty without giving any context about why we were here, and what was making this so hard, and why, in this very liberal city, we were grappling race no better than anywhere else. Hannah-Jones: In the end, I thought, if they can see this little girl, a girl that they can relate to more for class reasons, or for whatever reasons, will they then be able to finally relate to all these children who are suffering for our decisions? Who adults are making decisions for and about, and putting them in situations they don’t deserve. Ultimately, that was the reason why I finally said, “Okay.” I felt the small sacrifice of her anonymity as worth it if people could make a connection to all of these other children through her. Hannah-Jones: I needed to end with a gut punch, really. I needed to end with something that would stick with you, and you wouldn’t walk away from this story feeling like, ‘Yeah. This was really sad, but whatever.’ It was really important for me to end with that – in the end bring it back to the reality that all these 10,000 words are about these children. Listen to this podcast on iTunes, SoundCloud or Stitcher. For more, read Hannah-Jones’ piece Choosing a School for My Daughter in a Segregated City. One of the Articles of Faith in the Republican party and of conservatives since Raygun is “Trickle Down Economics”. The idea that making the rich richer, means they in turn will create jobs. In a country where small business creates 3/5ths of all new jobs – it really should have been apparent 30 years ago that this was a scam. Now all we need is for the paid Faux News harlots to come clean. MSNBC host Joe Scarborough complained on Tuesday that the Republican Party was fracturing because it had advocated economic policies benefiting the richest Americans for the last 30 years with the promise that the wealth would “trickle down” to others — but it never did. “You sound like Bernie Sanders,” NBC’s Chuck Todd pointed out. Many progressives believe that economic recessions and financial crises, by increasing economic anxiety among Americans, will bolster support for more liberal policies. Others believe that economic mismanagement by Republicans, either federally, or at the state level, will lead voters to support more left-leaning politicians. However, evidence suggests that financial crises actually bolster support for right-wing parties, and even Republicans whose governance is objectively disastrous can pull off re-election. In the current cycle, a white nationalist is leading the GOP race, and garners much of his support from ideological moderates and self-identified Republicans who are registered Democrats. We argue that economic insecurity tends to increase feelings of racial resentment, and that white liberals and marginally attached Democrats are particularly susceptible to increased racial resentment during times of economic crisis. This racial resentment undermines support for liberal policies designed to provide protection to the poor in times of economic crisis. For those interested in building a coalition to support progressive policy goals to reduce economic inequality, the lesson is that attention must first be paid to the continuing problems of racism and racial inequality. In a previous piece we showed that racial resentment, not economic peril, strongly affects support for the Tea Party and views on government spending. In a separate piece, we showed that racial resentment affects support for government action to reduce economic inequality, while economic peril has very little effect. Here, we explore how economic peril affects views of racial resentment and could be driving formerly independent or moderate voters toward Trump. Our analysis uses data from the 2012 American National Election Study, a wide-ranging survey of the political attitudes and behaviors of over 5,000 respondents. To measure feelings of economic insecurity we created a variable scale that combines five questions related to financial well-being — for example, whether an individual is worried about their finances. Racial resentment attitudes are measured with a scale created from five questions that characterize color-blind racial attitudes (for instance, “If Blacks would only try harder they could be just as well off as whites”). We control for individual race-ethnicity, age, income, gender, geographic region, party identification, ideology, political knowledge, importance of religion, feelings toward illegal immigrants, and overt racial stereotypes. We begin by exploring how the relationship between economic insecurity and racial resentment varies with individual race-ethnicity. 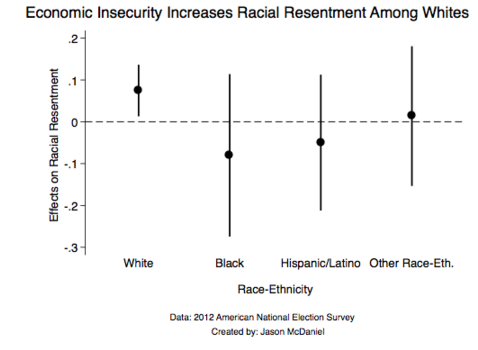 The results, illustrated below, show that increased perception of economic insecurity is associated with increased levels of racial resentment, but only among whites. Among people of color, economic peril has no effect on attitudes of racial resentment. When we examine only whites to discover how economic peril interacts with resentment across partisanship and ideology, we find that the relationship between racial resentment and economic peril is particularly acute among white liberals and Democratic partisans. 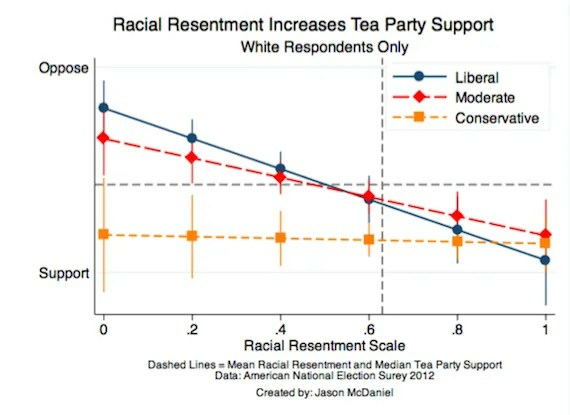 The graph below shows that conservatives and Republicans have higher levels of racial resentment compared to liberals and Democrats. Possibly because of this, increased perception of economic peril has no significant effect on racial resentment for Republicans and conservatives. 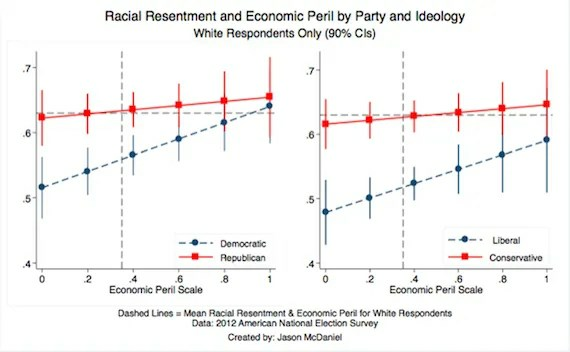 However, the results show that increased sense of economic peril substantially increases racial resentment among both liberals and Democrats. At above-average levels of economic peril, the resentment attitudes of white Democratic partisans become almost indistinguishable from those of Republicans. Additionally, the attitudes of white liberals become indistinguishable from those of ideological conservatives. This may help explain one of the most confusing parts of the Trump phenomenon: his success with moderates, independents and even some liberals. 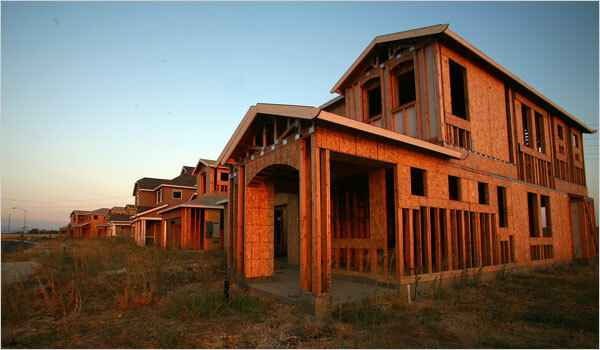 The 2005 Housing bust destroyed more black wealth than any event in American HIstory since slavery. Saw this one on my Amazon Reading List, downloaded it – and have been reading through it the last week or so on my way to work on the subway. Historian Edward Baptist’s treatise on how slavery made America has been greeted with both strong objection from the usual suspects as well as hailed for it’s detailed treatment of a complex historical subject, the ramifications of which still impact American Society today. What Baptist documents is what us students of American History have suspected for a very long time, but until this book – no one really documented it and brought it out front. 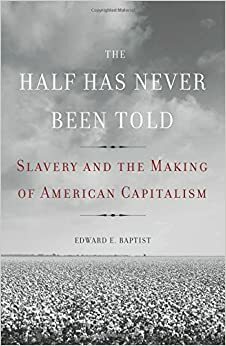 What Baptist succinctly points our and documents is the “capitalism” which grew this country from it’s founding in the early 1600’s to an industrial powerhouse owes it roots, and its foundation to slavery. Far from the oft repeated “land of economic opportunity”, slavery generated over half of this country’s economic might, and the worth of slaves alone constituted over 1/6th of the total wealth of the nation prior to 1860. This one smacks the”Southern Myth” regurgitated by conservative right wingers dead between the eyes. Part of a book review by the NY Times. Follow the link for the whole article. For residents of the world’s pre-­eminent capitalist nation, American historians have produced remarkably few studies of capitalism in the United States. This situation was exacerbated in the 1970s, when economic history began to migrate from history to economics departments, where it too often became an exercise in scouring the past for numerical data to plug into computerized models of the economy. Recently, however, the history of American capitalism has emerged as a thriving cottage industry. This new work portrays capitalism not as a given (something that “came in the first ships,” as the historian Carl Degler once wrote) but as a system that developed over time, has been constantly evolving and penetrates all aspects of society. Slavery plays a crucial role in this literature. For decades, historians depicted the institution as unprofitable and on its way to extinction before the Civil War (a conflict that was therefore unnecessary). Recently, historians like Sven Beckert, Robin Blackburn and Walter Johnson have emphasized that cotton, the raw material of the early Industrial Revolution, was by far the most important commodity in 19th-century international trade and that capital accumulated through slave labor flowed into the coffers of Northern and British bankers, merchants and manufacturers. And far from being economically backward, slave owners pioneered advances in modern accounting and finance. Edward E. Baptist situates “The Half Has Never Been Told” squarely within this context. Baptist, who teaches at Cornell University, is the author of a well-­regarded study of slavery in Florida. Now he expands his purview to the entire cotton kingdom, the heartland of 19th-­century American slavery. (Unfortunately, slavery in the Upper South, where cotton was not an economic staple, is barely discussed, even though as late as 1860 more slaves lived in Virginia than any other state.) In keeping with the approach of the new historians of capitalism, the book covers a great deal of ground — not only economic enterprise but religion, ideas of masculinity and gender, and national and Southern politics. Baptist’s work is a valuable addition to the growing literature on slavery and American development. Where Baptist breaks new ground is in his emphasis on the centrality of the interstate trade in slaves to the regional and national economies and his treatment of the role of extreme violence in the workings of the slave system. After the legal importation of slaves from outside the country ended in 1808, the spread of slavery into the states bordering the Gulf of Mexico would not have been possible without the enormous uprooting of people from Maryland and Virginia. Almost one million slaves, Baptist estimates, were transported to the cotton fields from the Upper South in the decades before the Civil War. The domestic slave trade was highly organized and economically efficient, relying on such modern technologies as the steamboat, railroad and telegraph. 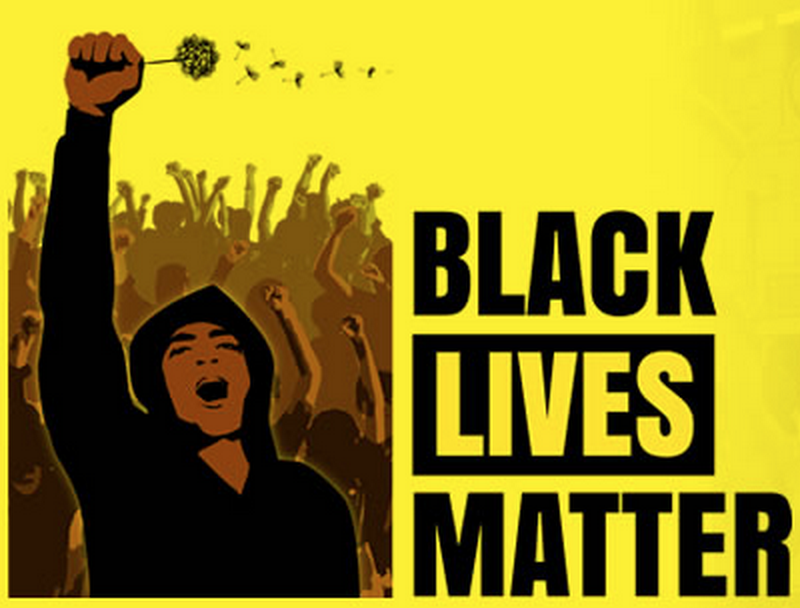 For African-Americans, its results were devastating. Since buyers preferred young workers “with no attachments,” the separation of husbands from wives and parents from children was intrinsic to its operation, not, as many historians have claimed, a regrettable side effect. Baptist shows how slaves struggled to recreate a sense of community in the face of this disaster. The cotton kingdom that arose in the Deep South was incredibly brutal. Violence against Native Americans who originally owned the land, competing imperial powers like Spain and Britain and slave rebels solidified American control of the Gulf states. Violence, Baptist contends, explains the remarkable increase of labor productivity on cotton plantations. Without any technological innovations in cotton picking, output per hand rose dramatically between 1800 and 1860. Some economic historians have attributed this to incentives like money payments for good work and the opportunity to rise to skilled positions. Baptist rejects this explanation. Planters called their method of labor control the “pushing system.” Each slave was assigned a daily picking quota, which increased steadily over time. Baptist, who feels that historians too often employ circumlocutions that obscure the horrors of slavery, prefers to call it “the ‘whipping-machine’ system.” In fact, the word we should really use, he insists, is “torture.” To make slaves work harder and harder, planters utilized not only incessant beating but forms of discipline familiar in our own time — sexual humiliation, bodily mutilation, even waterboarding. In the cotton kingdom, “white people inflicted torture far more often than in almost any human society that ever existed.” When Abraham Lincoln reminded Americans in his Second Inaugural Address of the 250 years of “blood drawn with the lash” that preceded the Civil War, he was making a similar point: Violence did not begin in the United States with the firing on Fort Sumter. This is America on conservatism. And then they “deregulated” Wall Street and the banks to steal. Home of the Brave, Land of the Free, Land of Opportunity? A steady fall since Raygun economics. The American Dream is supposed to mean that through hard work and perseverance, even the poorest people can make it to middle class or above. But it’s actually harder to move up in America than it is in most other advanced nations. 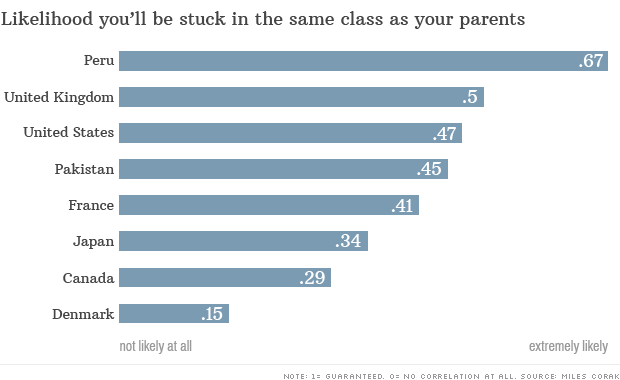 It’s easier to rise above the class you’re born into in countries like Japan, Germany, Australia, and the Scandinavian nations, according to research from University of Ottawa economist and current Russell Sage Foundation Fellow Miles Corak. Among the major developed countries, only in Italy and the United Kingdom is there less economic mobility, according to Corak. The research measures “intergenerational earnings elasticity” — a type of economic mobility that measures the correlation between what your parents make and what you make one generation later — in a number of different countries around the world. Economists aren’t certain exactly why some countries have a greater degree of mobility than others, but they do point to certain similarities. Greater current inequality: The more unequal a society is currently, the greater the chance that the children will be stuck in the same sphere. This is because wealthy families are able to provide things like tutors and extracurricular activities — and the time to pursue them — that poorer families often cannot. Also, education matters a lot more now than it did 100 years ago in terms of getting a good job. “The rich can pump a lot more money into their kids’ future,” said Corak. This helps explain why counties like China, India and many South American nations also exhibit relatively little economic mobility. Families: Having a stable home life is also associated with the ability to climb the economic ladder, said Corak. The United States tends to have higher rates of divorce, single-parent homes, and teenage pregnancy than many other industrialized counties. Social policies: Counties that redistribute wealth — through, say, higher taxes on the richand more spending on the poor — tend to have greater social mobility, said Francisco Ferreira, an economist at the World Bank. This is especially true when it comes to education spending. Critics have long contended that the U.S. system for funding education — where school funding is largely based on property taxes — perpetuates inequality far more so than a system that taxes the whole country for schools, then redistributes that money to the districts that are most needy. If why Americans have a harder time making it into the middle class is a bit of a mystery to economists, why Americans cling to the belief that it’s still easy to do is even more baffling. It could be because, during the late 1800s and early 1900, the United States was a much more mobile country than Britain, said Jason Long, an economist at Wheaton College in Illinois. But no society has total mobility. Class is always going to be somewhat correlated to one’s upbringing, Corak noted.